Plate 7 from the third set of Thomas and William Daniells' 'Oriental Scenery.' Kannauj, the ancient city of Kanyakubja, the capital of the Emperor Harshavardhana and later of the Pratihara dynasty, had by the early 15th century become an important Muslim city, part of the Sultanate of Jaunpur. The Jami' Masjid or Congregational Mosque in Kannauj was converted from former Hindu buildings in the period 1400-06 by Sultan Ibraham Shah of Jaunpur. 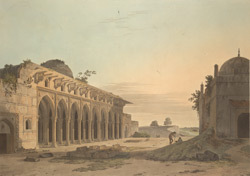 The Daniell print shows the relatively unadorned front of the half ruined prayer hall with its pointed arches and polygonal columns typical of Muslim architecture in India before the arrival of the Mughals, although the richly carved corbels supporting the mostly vanished chajja or heavy eave are typically Hindu. Facing the mosque is part of a tomb.